For my “urban gardens collection” (check the Jardins de Telheiras article) this one is closer to home. 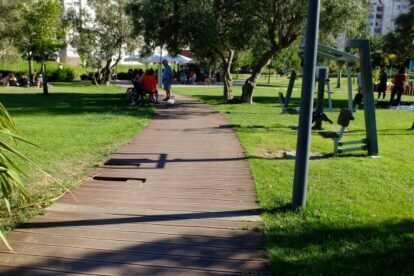 Located in Benfica neighborhood, this park is a nice contrast with the rest of the urban area, thankfully. It has an extensive green area, a bicycle path, a children’s playground and a coffee area. It is right next to Colombo mall and Benfica Stadium, so if you choose to go on a shopping spree or visit the sports “cathedral” as the fans call it, you can come here and relax afterwards. It’s right next to the metro station of Colégio Militar/Luz (blue line). Completed in 2011 this park was rehabilitated and even won a national prize in Landscape Architecture. Although it’s definitely not a tourist highlight, in the warmer months I’ve found groups of young people from different countries sitting on the grass or having a beer at the terrace, which is cool and welcoming. As it turns out, the nice Kiosk at the park, besides precious coffee and simple meals, serves also a higher social purpose as it contributes to the rehabilitation of Casa Grande (the house that gave the name of Quinta da Granja), today a place dedicated to treating Asperger’s patients. It is open from 10:00 – 20:00 in the winter, and from 10:00 to 22:00 in the summer.